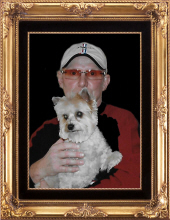 Richard Wayne Foster, 61 of Luckey, OH, passed away Thursday, February 7, 2019 at Hospice of Northwest Ohio, Toledo, with his family at his side. He was born January 31, 1958 to Richard Eugene and Patricia Jane (Hoyer) Foster in Fostoria, OH. While Richard worked in various capacities, he was passionate about funeral service and was most noted as a Mortuary Assistant with Deck-Hanneman Funeral Home in Bowling Green for nearly 10 years. A man with a wonderful sense of humor and a zest for life, he was known to be “the dog whisperer” to many. He had such a love for dogs particularly Brody and Luther as well as the neighborhood dogs whom he always had a treat for. However, family was his greatest joy, be it holiday gatherings or attending the nephews sporting events, it was family that remained at the center of his life. Richard is survived by his mother: Patricia Foster of Luckey, sisters: Debbie (Chuck) Cannon of Sylvania, Brenda (Dennis) Huprich of TN, Nicole (Rick) Swank of Swanton, brother: Mick (Nancy) Foster of Luckey, nieces: Angie (Eric) Blum), Tanya (Derek) Lederman, Christine (Eric) Rutherford, Whitney Foster, nephews: Alan (Javier) Huprich, Brian Cannon, Carter Swank, Garrett Swank, great-niece: Maya Blum, great-nephews: Reade Blum, Braylen Lederman and special k-9 pal Brody. Richard was preceded in death by his Father. To send flowers or a remembrance gift to the family of Richard Wayne Foster, please visit our Tribute Store. There will an additional time of visitation beginning at 9 a.m. until time of service. Officiating, will be Pastor Lori Ann Strang. There will be a bereavement luncheon served in the fellowship hall of Salem-Grace Untied Lutheran Church, 216 Main Street, Luckey, immediately following the cemetery committal service. "Email Address" would like to share the life celebration of Richard Wayne Foster. Click on the "link" to go to share a favorite memory or leave a condolence message for the family.